AUPH is a small biotech which is developing a drug,vocolsporin for lupus nephritis . Last summer the stock tanked when ten patient deaths were reported in the study. The company claimed none of the deaths were drug related however the market didn't really believe them. Tonight the company announced that after 6 more months hr remission rate went from 33% to 49% and just as importantly there were 0 deaths among those taking the drug. This paves the way for the company to begin a phase 3 study to gain approval which may begin as soon as next month. Lupus nephritis is often fatal and pretty common complication of lupus There is a real need for more effective drugs for the disease of which hopefully ,vocolsporin can become the new standard of care. The company is also actively looking to partner Voclosporin in Japan . They recently ran a phase 1 trial there with the intention of landing a partner. I assume with the release of yesterdays data a partner should not be hard to find and should come with a nice up front payment. That being said, if AUPH happens to run to the $7-$8 level I would absolutely expect a capital raise sooner rather than later. I also looked into the size of the Lupus nephritis market, and needless to say its bigger than I thought. There are roughly 1.5 million Lupus patients in N. America and somewhere around one third of them end up with nephritis ( I have actually seen higher estimates). Assuming 500k patients with about half of those eligible to receive Volclosporin (some are misdiagnosed, some aren't yet on treatment, and some are beyond treatment) that's 250k patients at a possible $30,000 per user per year that is an $7.5 billion market just in North America. Assume they get about 30% of the market is not unreasonable to say Voclosporin could be a $2 billion dollar or more drug here in the US . The EU market is even bigger than in N .America though obviously the price for the drug will be much cheaper. The company is in talks with the EMA about setting up a trial design for approval . I wonder if they may try to get the drug approved based on the US phase 3 or partner the drug there and run a separate phase 3 with a partner. We should hear back from the company on this issue over the next few months. With 50 million shares outstanding, the stock, even at the current $6 level has only a $300 million market cap which is ridiculous for a blockbuster drug entering phase 3 with impressive phase 2 data. DNDN is down almost $3 in the pre market on rumors that the FDA will be having an Advisory committee panel to decide on the approvability of Provenge. This is a bit of a surprise if true as it was assumed that since the company already had a panel several years back which was voted on positively they would not be another one. However even if there is a panel is see almost zero chance the drug is not voted on positively by the panel, and thus approved by the FDA. I added 100 shares at just under $30. DNDN just exploded to the upside after an FDA spokesman just said that there would be no panel for Provenge. Biotechnology stocks are one of the most explosive sectors in the stock market. When they are hot no other group does as well. However with substantial rewards also comes extremely danger and that means you need to be well prepared. The key to success in biotechnology investing is anticipating and understanding the news flow while balancing risks against rewards. Shark Biotechnology editor, Daniel Rosenblum, not only understands the science involved but is a master of navigating through the mine field of clinical studies and FDA approvals. 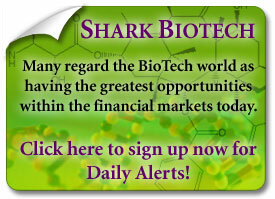 If you want to find the best opportunities in biotechnology give Shark Biotechnology a try.